The scorecard provides a benchmark of state energy policy and progress. The American Council for an Energy-Efficient Economy (ACEEE) has released its 2018 State Energy Efficiency Scorecard. For the second year in a row, Massachusetts is ranked number one and California number two. The two states shared the ranking of number one in 2016, and this battle to be the top state goes back at least as far as the scorecard has been published. California is the only state to have held a spot among the top five in all 12 years, followed by Massachusetts, which has been a top five state for 11 of the past 12 years. Even in the absence of federal progress, many states are making improvements, including New Jersey, which was identified as the most improved state; other substantially improved states were Missouri, Colorado, South Dakota and Connecticut. Sixteen states did drop in their ranking this year, most notably Iowa, which saw the largest drop in ranking of all states for the second year in a row. The drop in ranking this year was due mostly to bill SF2311, signed earlier this year, which imposes a restrictive cap on energy efficiency programs and allows customers to opt out of program elements. ACEEE developed the scorecards to “give state-level policymakers a road map for building stronger and more resilient communities.” Plus, a little friendly competition never hurts. The scorecards are a great resource, providing a benchmark of state energy policy and progress. The scorecard uses a 50-point scale across six categories, helping the reader drill down into areas where a given state can benefit from improvements, as well as highlighting areas in which the state is a top performer. States are spending more on energy efficiency in the utility sector—and they are saving more. States have ramped up efforts to promote zero emission vehicles, even as the federal government has sought to freeze fuel economy standards for cars and SUVs. There is a push for zero energy construction through stronger building energy codes. The CA 2019 Building Energy Efficiency Standards are a great example. 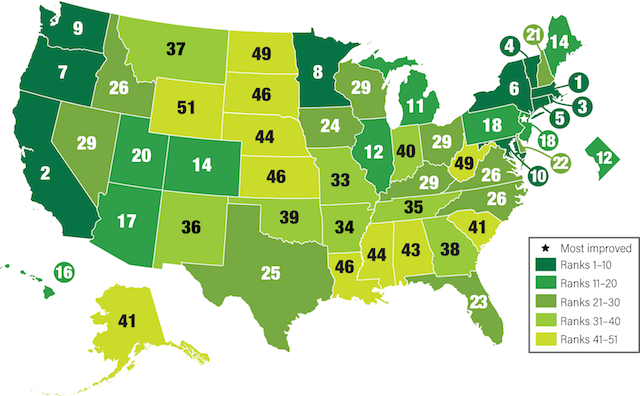 All states ranked in the top 10 this year have an Energy Efficiency Resource Standard. No matter where your home state falls in the rankings, the ACEEE State Scorecard is a beneficial tool for identifying energy efficiency programs, policies and strategies to create a more resilient state. An updated city scorecard will be released in the summer of 2019. This was written by Jennifer Gunby for The US Green Building Council. To see the original version of this article, please click HERE.